While Mahin is not the most proficient fighter around, he can handle swords well enough to defend himself and tries to avoid confrontation if he can. As a result of torture methods he suffered in the past, Mahin is easily exhausted and prone to distraction, but can take significant amount of physical punishment. The poor kid also demonstrates exceptionally terrible handling at being teased. 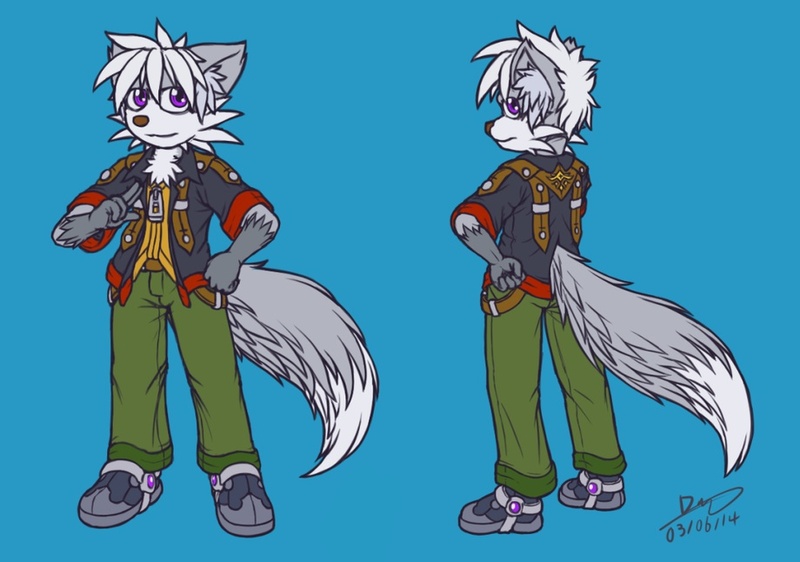 Mahin is a rather cheery fox who prefers to stay indoors and occupy himself with cooking recipe books, although he is not too shy from venturing outside and exploring the hidden depths of the world. While he can be easy to get along with, he does have his unpleasant side under stress, particularly when he feels like he is being used. Not being able to understand what's going on greatly annoys him. Mahin used to be a close friend to a young prince of chaotic, but vibrant Kingdom of Grezivet. Seeing the huge mana potential, Prince Satoa took Mahin in at young age to have him trained as an Ark Knight despite objections from the royal court admonishing the prince for allowing an outsider to become a royalty. Mahin was on his way to becoming one of the most powerful Ark Knight the kingdom has ever trained, until he was framed for murdering an unpopular ambassador from a foreign state which was not in friendly terms with Grezivet. The young fox was swiftly imprisoned and underwent brutal and humiliating torture which permanently disabled his ability to cast magic. Knowing that the royal court will call for an execution, Prince Satoa had no other choice but to trade Mahin away into slavery in return for peace with the foreign state. Mahin was shackled to toil away in slave labor for two years until a freak accident occurred at the camp he was kept in and allowed him to escape in the confusion. He did not get far however, as the slavers were able to track him down and eventually corner him in the nearby ruins. But by pure chance, a lone raider Lazra Kaire also happened to be in the process of ransacking the ruins, and after a series of misunderstandings was forced to take down the slavers. Lazra took Mahin under her wing ever since, working with her aboard the Saber Dust airship in search of lost artifacts. Mahin's been a long overdue for a real profile image... that was supposed to happen years ago. It's been well over 5 years and he looks virtually the same when I first made him. Bio is very well done as well, very interesting. Thanks! I had to look up a reference image to get that back profile, and the clothes went through so many different variations. I might end up changing the pants color again. Well overall budd I can say it looks very well done and you should be proud of your work, honestly you did great. When in doubt, use more belts! And Zippers. Kids love zippers. I want my money back! ...And my belts! This seems to be in medieval times with a hint of magic and future engineering. Am I sort of correct. Magic and future engineering? Yes. The setting's timeline is comparable to our 1990's technology though. Ok and do you role play much.